The Spurs boss felt his team should have a had a spot kick, but conceded his team were second best. Mauricio Pochettino felt his team should have been awarded a late penalty. 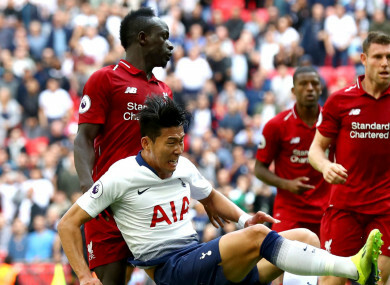 TOTTENHAM BOSS MAURICIO Pochettino felt his team merited a stoppage-time penalty in their 2-1 loss to Liverpool . “Of course, I think they were better. We competed, we were close and the last action was crazy because it was a penalty,” Pochettino told Sky Sports. “We should be talking in a different way, but Liverpool were better. “It is easy to criticise the performance because we lost the game and conceded many chances, but the circumstances were the same when we beat Manchester United,” he said. “It is a lot to analyse and try to fix. I think we are far way in terms of performance. Pochettino added: “I am not a person who suffers too much. I try to find the solution. Don’t worry for me – we need to be worried for the real things. I am so good, I am so happy. “We started the season with good results, but we knew the circumstances and the reality after the World Cup were completely different. Email “'It was a penalty' - Pochettino bemoans no-call in Liverpool loss”. Feedback on “'It was a penalty' - Pochettino bemoans no-call in Liverpool loss”.